There are very few books of poetry that make you feel uncomfortable while reading them. You admire the versatility of the poet, the striking imagery and the immaculate construction of the book, but the content is disturbing. 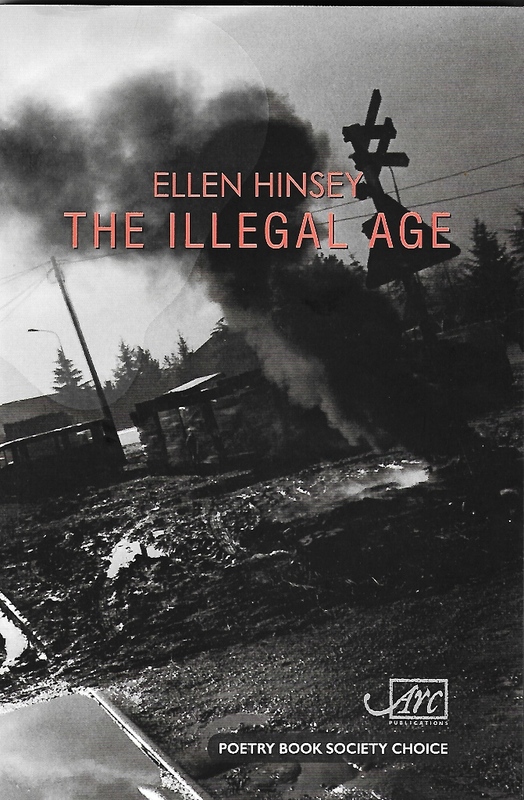 Ellen Hinsey‘s The Illegal Age (review) is one of the these books. The subject of the book is totalitarianism across the world and what she refers to as “political illegality” as seen, many would argue, in regimes such as that in Turkey today. So this is not poetry for the faint-hearted and it may be seen as very different from lyrical poetry dealing with nature for example. On the other hand, it is not so different, in that the poet is using imagery to allow us to examine the subject of the poems. The book is highly structured, with 3 sections, each with 7 sub-sections and the reviewer above suggest that the poet may be trying to replicate the bureaucratic structures of oppressive regimes – something I had not thought about. The first section beings “Nothing happens quickly; each day weighs on the next -/ Until the instant comes -” when someone walking “along/ The foggy lane in innocence” disappears. This suggests the gradualism of oppression. Another section deals with The Inconceivable which again creeps up on society until it is too late. This reminded me of Germany in the 1920s and 1930s when most people would have seen the consequent rise of Nazism as inconceivable at the time. Hinsey then writes “.. the Inconceivable seeps forward, mastering territory with the unpredictable sleight of a storm’s stealth” – a frightening but beautiful image. In The Denunciation, subtitled East Germany 1979, a woman reflects on her husband/lover’s betrayal, asking when it began e.g. “when you sat together by the braille of a restless lake” or when he kissed her “by the prying iridescent eye of the butterfly”. Both these images – of the lake and the butterfly – are very imaginative and in another context would be uplifting and Hinsey does this throughout the book, to great effect. This will not be the most comfortable read of you life, but it does stress how important it is to record the rise of oppression and to remember it. Hinsey’s imagery will stay with you for a long time. 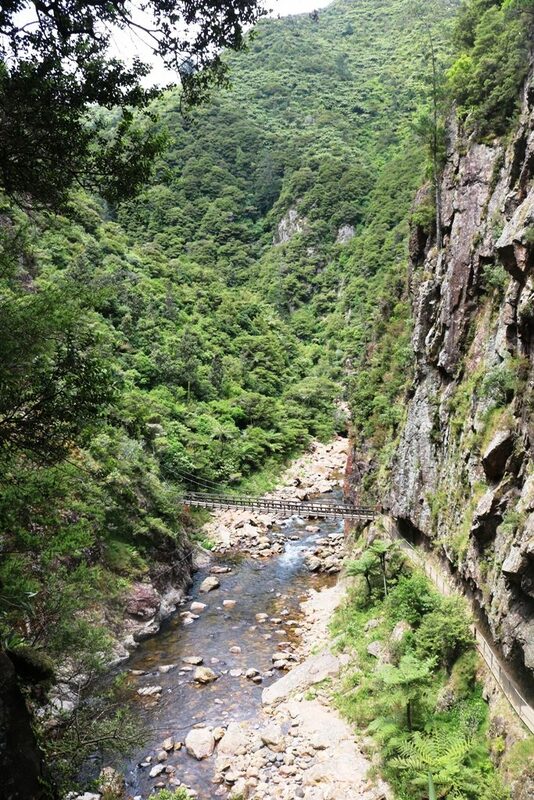 On our trip to New Zealand, our niece took us to Karangahake Gorge (good photos) which is the site of an old gold mine. There are a number of different walks and we chose one of the longer ones which took us to the top of the hill which housed the mine. There are many interesting boards along the way and the one at the start of the walk (below) gives you an insight into what you might be encountering along the way. 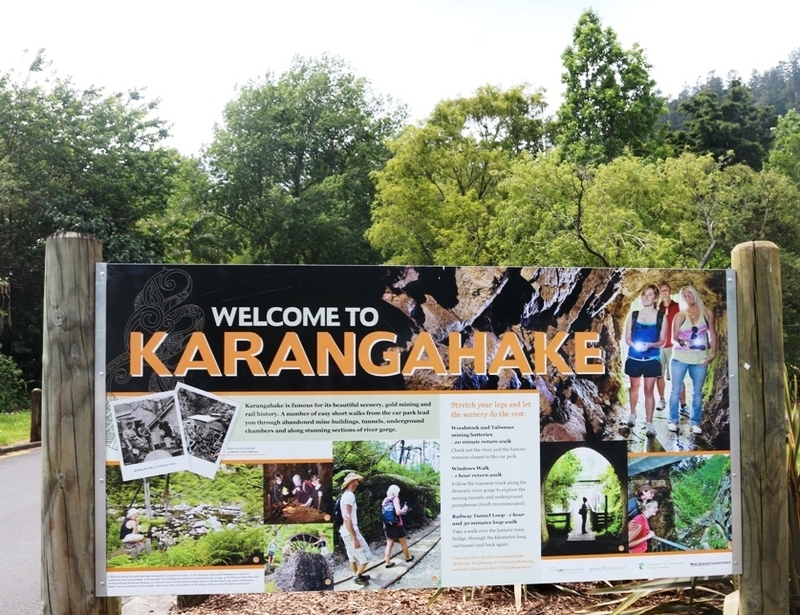 It was in the late 19th and early 20th centuries that gold mining was undertaken by large British companies at Karangahake and there is a good history here. As you go up the mount, you come across the remains of the mining infrastructure and equipment. Working in these gold mines was a hazardous occupation, as cyanide was widely used to extract the gold. The information board below shows some of the machinery used to crush the stone and then to mix the ore with cyanide. The ore/cyanide mix was made into bullion and on the bottom right, you can see a photo of a man pouring the molten liquid into a barrow. Health and safety regulations were unheard of in those days and other boards told of the fatalities that occurred in the mines. As you climb to the top of the Mount Karangahake you pass many of the railway lines used to transport the stone down to the processing plant near the river. You also go through dark tunnels (phone torches needed) and you get the feeling of how claustrophobic it must have been in many parts of the mine. The walk is steep in parts and tricky in others but it is worth climbing to near the summit to get the views down to the river, as in the photo below. One of the most fascinating features of this walk was the variety of ferns which we encountered along the way. The ferns themselves were of a multiplicity of greens and very attractive in themselves. 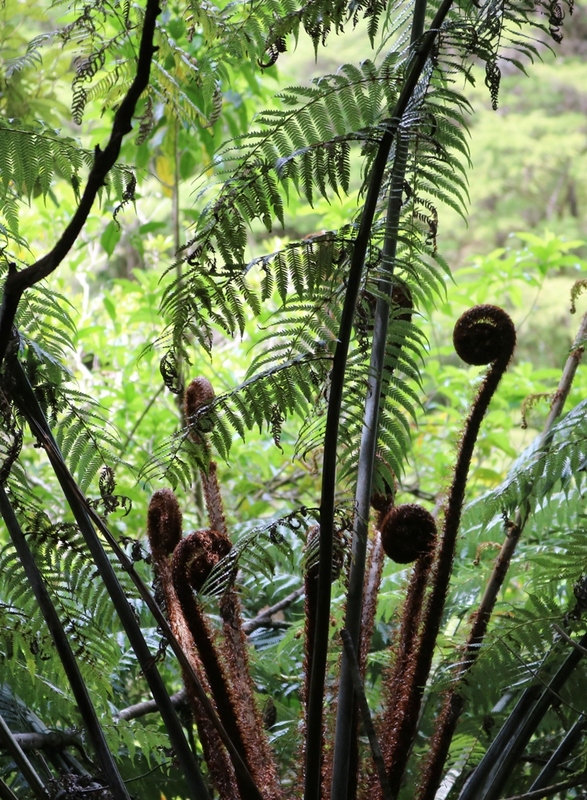 What was more striking were the fronds which emerged from the ferns. 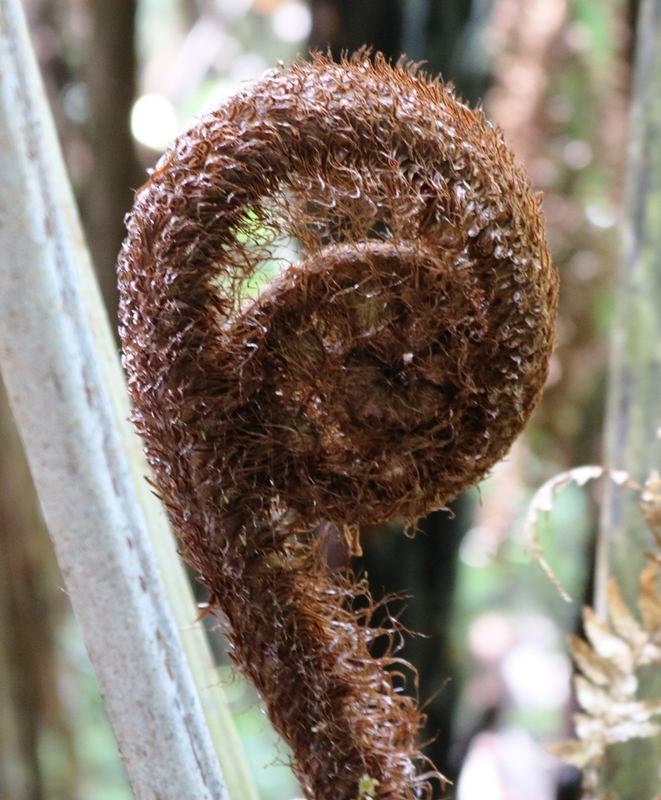 The photo below shows the fronds emerging from a silver fern and the stem is called a koru. A close-up view (below) shows the delicacy of the frond which looks as if it could have been knitted or woven and the design might be used as the figurehead of a walking stick. With its delicate hairs on display, it also resembles what might be a curled up millipede, waiting to strike the next unassuming insect. 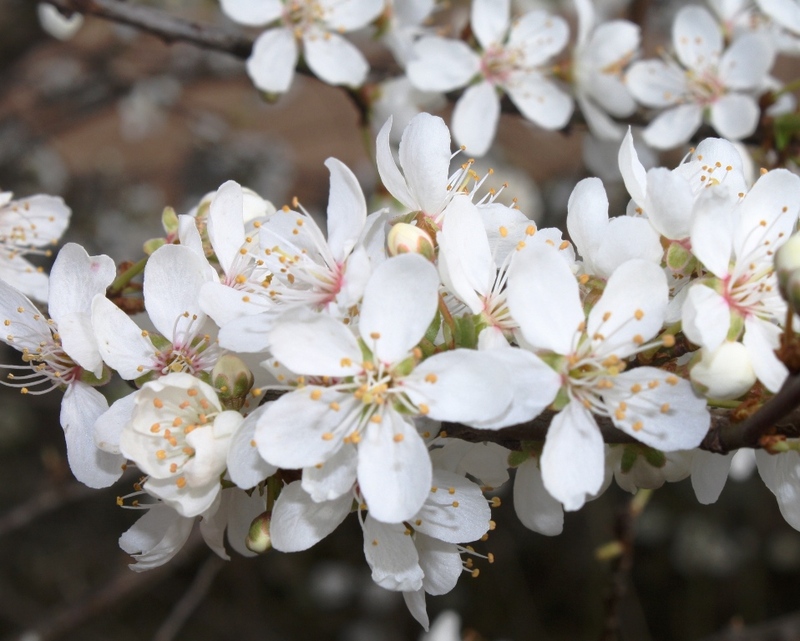 This is nature as sculpture and a strikingly beautiful example of it. The Karangahake Gorge/Mount walk is an exhilarating one from start to finish and I highly recommend it to anyone visiting the area. Near the end of the walk, I took this video at the side of the river. 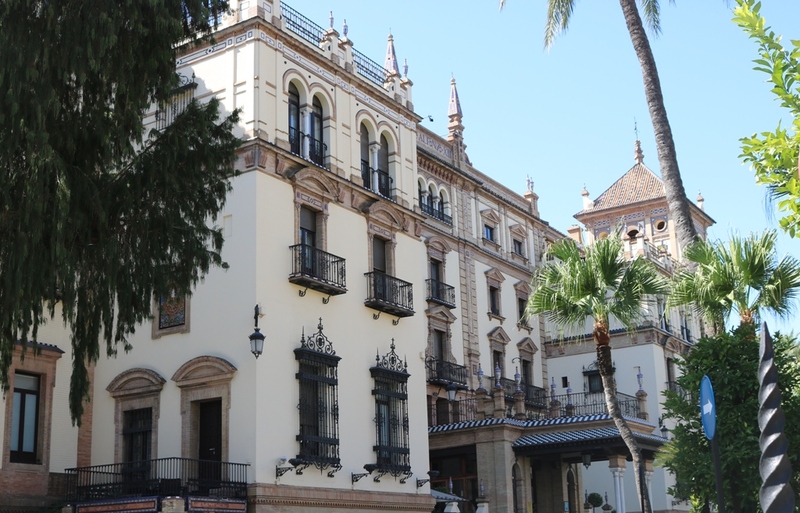 In the centre of Seville, just along from the cathedral is the Archivos des Indias or General Archive of the Indies. 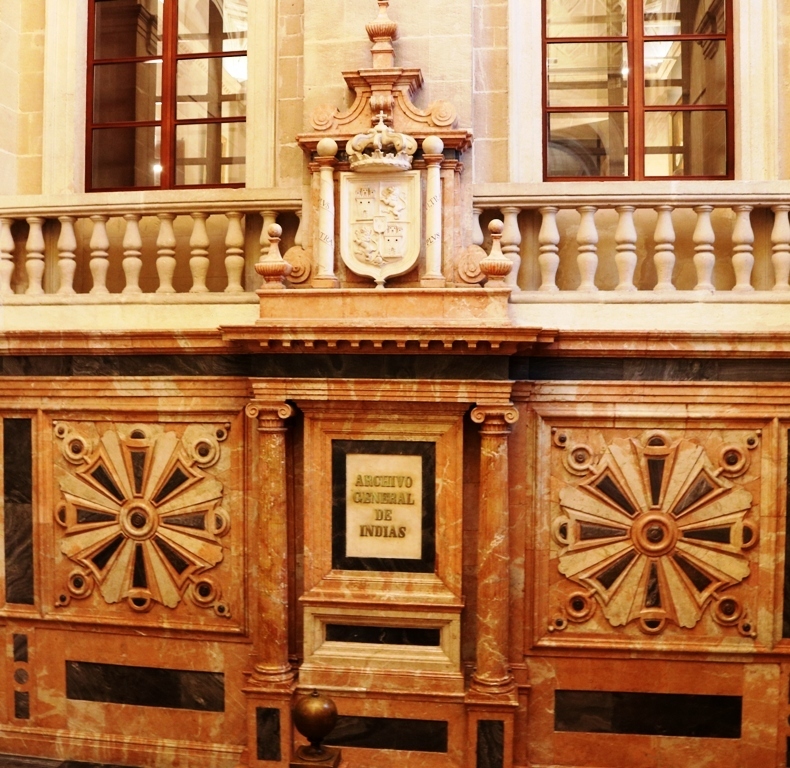 The huge archival collection, which covers 300 years of Spanish colonisation in the Americas, is housed in a strikingly attractive building (see below) which has superbly crafted ironwork on it many balconies and eye-catching tiles around its upper sections. While many scholars visit the archives for research, most people go to see the interesting interior of the building. In the building’s many rooms, there are displays of examples of the archival material held there, such as Columbus’ letters to his son or a catalogue of fabric samples. What is most remarkable is the design of the interior with its delicately crafted wood and sculpted ceilings, which are worth taking time to look at closely. 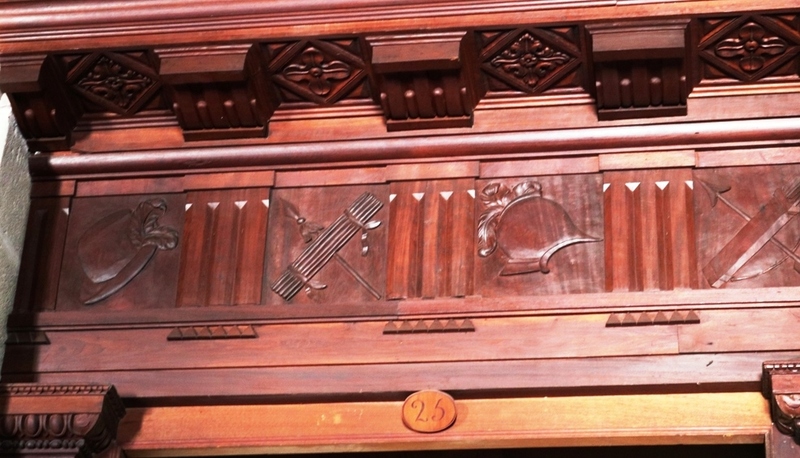 As you see in the photo below, there is a variety of symbols carved into the wood and these may represent the trades of the merchants who first used the building to carry out their trading. As you walk down the marble stairs, there is an impressive array of carvings around the sign for the archives. In the photo below, above the name, there is a crown and carved crests and on either side of the sign, and there are beautiful marble pillars and star-shaped carvings. This symmetrical design – at once simple and complex – makes you stop on the staircase and look at the carvings. This is clearly the work of expert craftsmen. I took a wee video of the inside of the main room in the archive – see below. 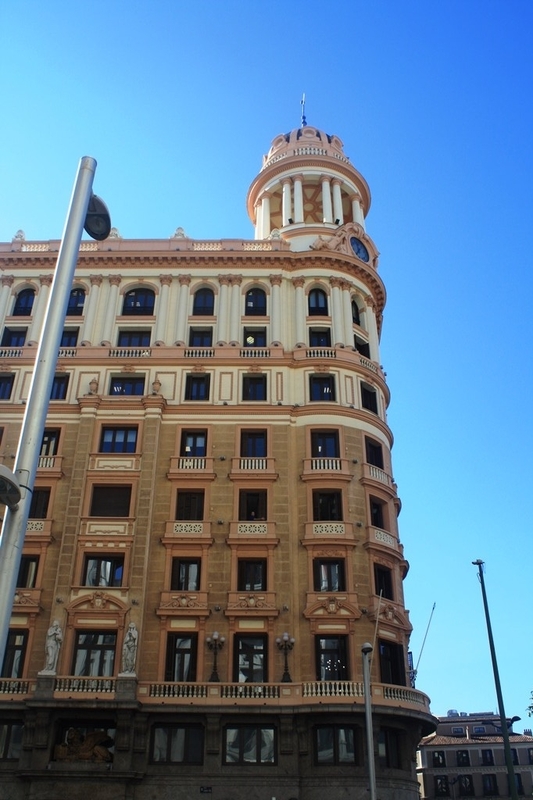 There was also a 15 minute video – in English and Spanish – which tells the history of the building. What is intriguing about this video is that the narrator is the building itself, telling how “I” began as a merchants’ building , fell into ruin and eventually became the archive we visit today. On the trip to Seville, we made the fatal mistake of not booking online for fabulous Alcazar Gardens and were faced by a huge queue in 30 degrees of sunshine, so we moved on. We were rewarded not far away with the spectacular Esplanada de Espana (good photos), a magnificent crescent of connected buildings, with 2 huge towers at either end. This splendid edifice was built in 1929 but it looks much older. The photo below shows one of the towers which rises above the canal, which goes round part of the square. 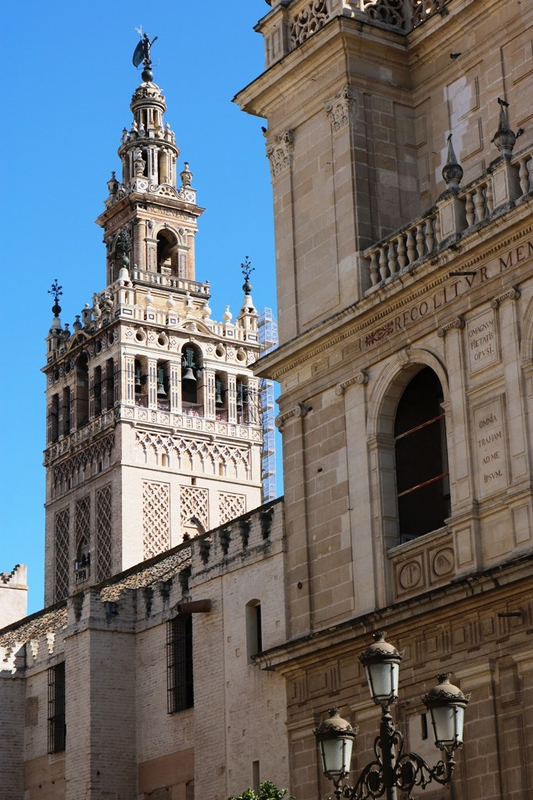 Looking at the towers, it makes you think that this might be a tribute to traditional Spanish architecture and design, with the layers to towers rising to a peak, suggesting a Moorish influence at the top. 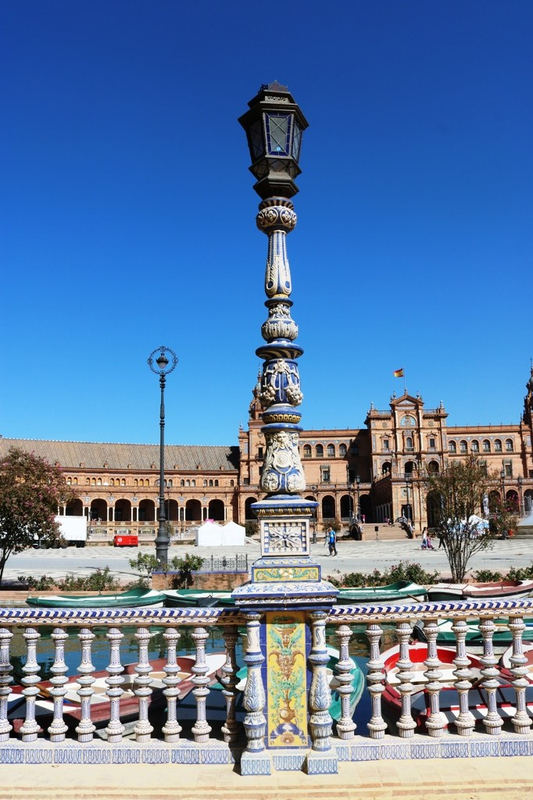 An outstanding feature of the area is the ceramics, starting with the array of pillars which go around the perimeter of the entrance and around the canal. As you see in the photo below, there are ceramic figures on the pillar and tiles at the top and bottom of the ceramic pillars. The tiles are known as azulejos and have been made since the Romans were in Spain. The coloured tiles are thought to have been introduced by the Moors and there are definite signs of Moorish/Islamic influence in all parts of this building. On the walkway above the canal, there are large areas of mosaic tiling and at regular intervals, there are large tiles depicting all the different regions of Spain. The example below celebrates the province of Huelva, which lies to the west of Seville and stretches to the Portuguese border. The colours in each of the squares are vibrant and it is interesting to see the different coat of arms for each region. 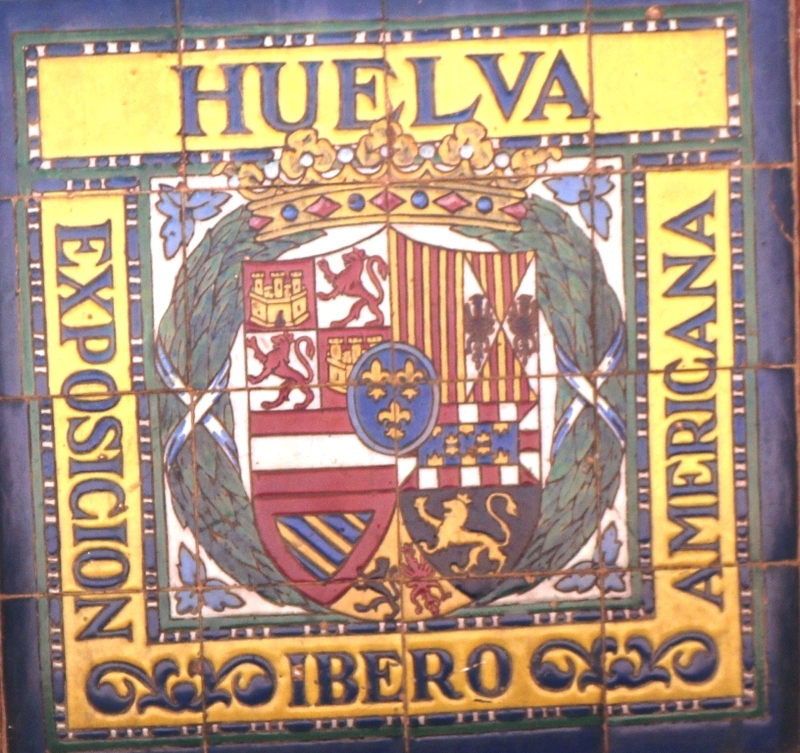 The Esposicion Ibero Americana noted in the tiling was a world fair in 1929 to enhance trade particularly between Spain and South America. There is so much to see in the Esplanada that you can easily spend an hour or more looking at the building from different perspectives e.g. there are balconies on to which you can climb to look down on the square and the canal and across to the two towers. 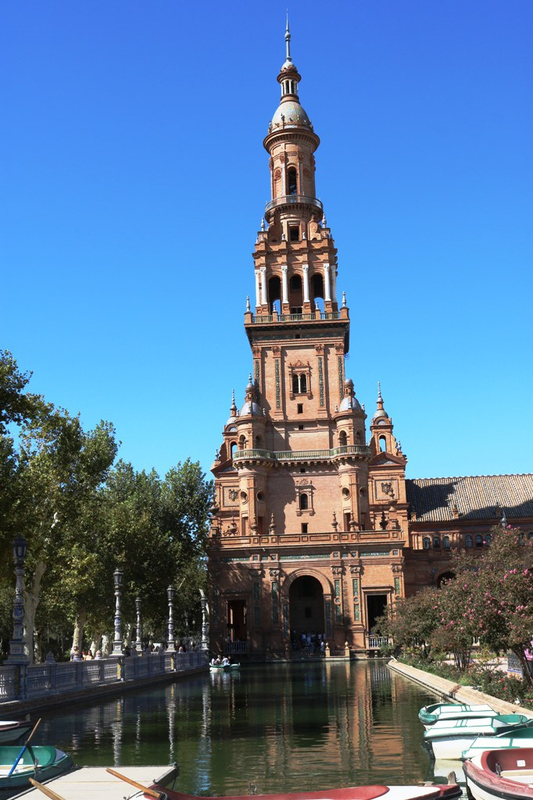 You must not miss this out in a visit to Seville. I took a video of the Esplanada de Espana and I hope that this gives you a flavour of the uniqueness of this very joyful building and square. A delayed blog due to your blogger’s significant birthday celebrations. I was shocked to read an obituary in the Guardian about the death of the poet Matthew Sweeney, who was only 65 years old. He died of motor neurone disease, a terribly debilitating illness of which one of my school friends died. 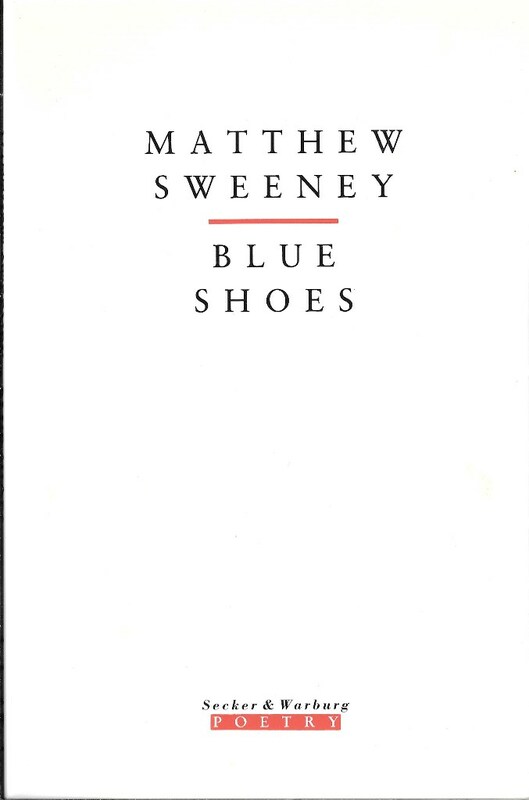 I looked in my collection of Poetry Book Society choices on my bookshelves and found Sweeney’s 1989 collection Blue Shoes. Sweeney was an imaginative and often humorous poet . The Lighthouse Keeper’s Son from Blue Shoes, reads after the title “got arrested/ as he wobbled home on a lightless bicycle, after a late drink/ and he asked the cop/ if the pockmarked moon/ wasn’t light enough/ not to mention the Plough’s/ seven stars/ and his dad’s beam/ lighting the road/ twice a minute/ then searching the sea/ the umpteenth time/ for nothing”. While this is a humorous poem, maybe set in the Irish countryside, about a drunk man, a bike and a policeman, it is also one that contains intriguing imagery. The moon is “pockmarked” and the lighthouse “searches” the sea for “nothing”. The last word is ambiguous – does it mean that the light normally does not reveal anything in the sea, or is the light doing it for free? It is of course, not the light that searches but maybe the keeper. 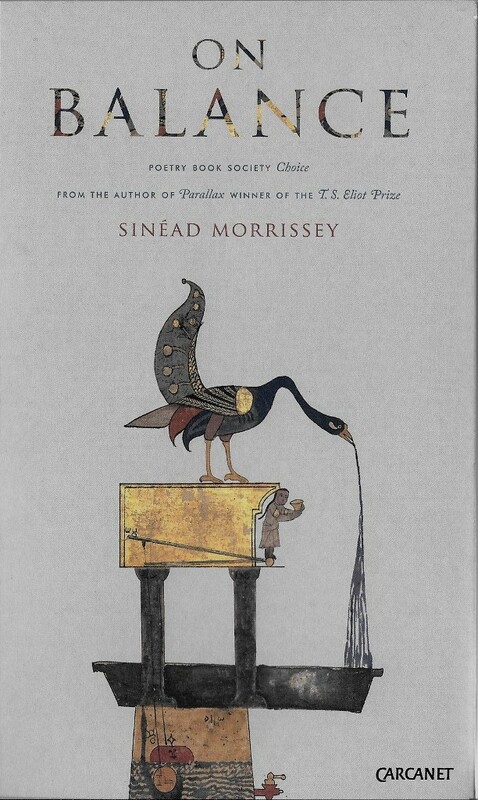 You can hear Sweeney reading his poems here and they are certainly worth listening to. On a recent trip to trip to the beautiful city of Seville with my pal, the main impetus of the visit was to see the football (aka soccer) match between Sevilla and Celta Vigo on a warm October evening. Those not interested should skip the next bit and go to the next paragraph. Here is the inside of the stadium just before kick-off. We were there of course to also enjoy the city and its magnificent architecture, excellent restaurants and its culture. To say that Seville Cathedral is massive is a gross understatement. Some of its chapels are the size of cathedrals in other parts of the world. It was built on the site of a 12th century mosque and it took over 100 years to build, so both religions wanted something impressive to represent their faith. 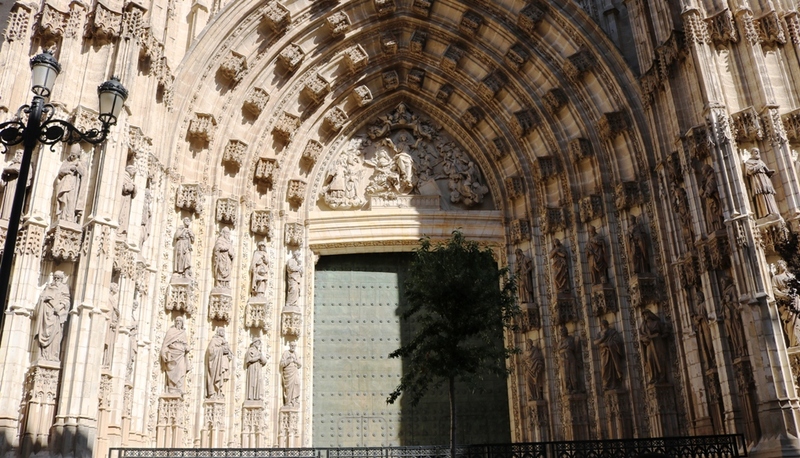 The outside of the cathedral is so extensive that you cannot photograph it all at once. The first photo shows the magnificent bell tower and the 2nd photo shows the exquisitely ornate main entrance to the cathedral. Inside the cathedral, the high vaulted ceilings and the perfect stonework of the pillars lead you into different areas and altars, such as the beautifully crafted and imposing silver altar. This video which I took in the main part of the cathedral, gives you an idea of the cathedral’s grandeur, including the superb sculpture of the tomb of Christopher Columbus, although there is some doubt as to whether it is Columbus or his brother that is in the sepulchre. The cathedral is always busy with tourists, religious people and humanists, and each person will take their own view of this utterly stunning building and its variety of interior decoration, which displays an amazing range of craft skills and artistry. It is certainly a must visit to this enchanting city. An aesthetic slant to the blog this week with a focus on design and architecture. 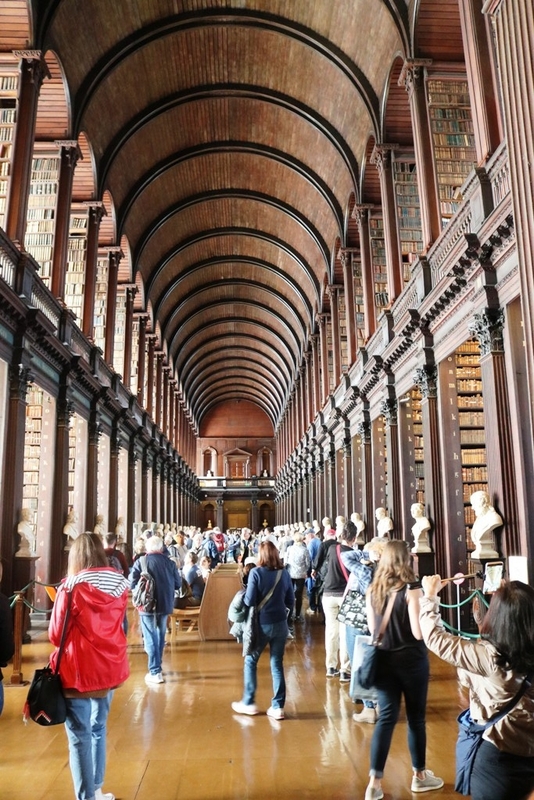 On our recent trip to Dublin, we visited Trinity College Dublin to see the Book of Kells exhibition. The Book of Kells has uncertain origins but it is thought to have been written around 800 CE by monks from Iona, an island off the west coast of Scotland and Kells, a town in Ireland. The monks fled Iona after a Viking attack and settled in Kells. Where exactly parts of the manuscript – a bible – were written is uncertain. The Book of Kells is wonderfully illustrated and the exhibition contains blown up pages which are shown on the walls, as in the photo below. 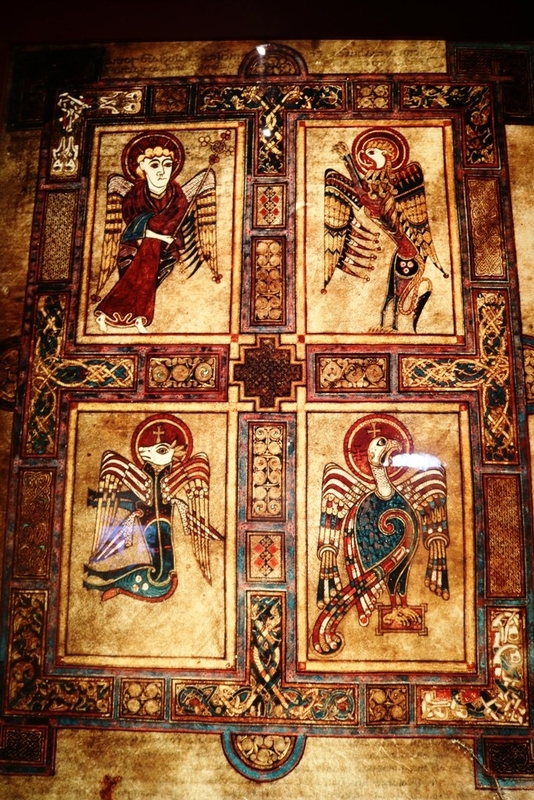 This page shows in detail saints, angels and demons interspersed with Celtic designs. This demonstrates the superb skills of the monks who completed these lavish and extremely time-consuming illustrations. In other pages, there are beautifully designed letters by one of the artists who was ” capable of ornament of such extraordinary fineness and delicacy, that his skills have been likened to those of a goldsmith”. 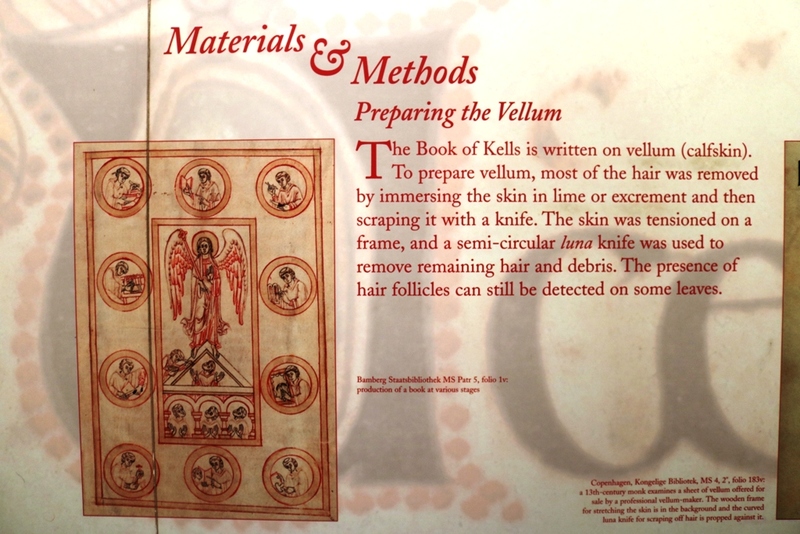 The exhibition also looks at the technical aspects of book production as in the photo below, showing that the manuscript was written and illustrated on vellum. In some cases, the treating the vellum could not have been a pleasant experience. Thus the preparation of the vellum as well as the composition of the book was laborious. As the Book of Kells was written in Latin and in the early 9th century, very few people would have been able to read it, apart from monks. These early religious works reflect their historical era i.e. the contents of the book were to be read to the mainly illiterate population, not read by them. You can see more of the illustrations from the exhibition in the video below. 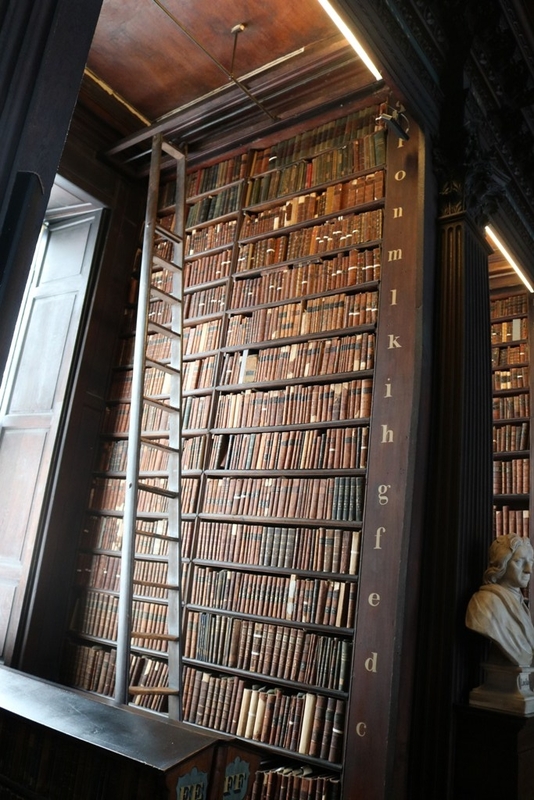 The exhibition then leads visitors upstairs to the Long Room of Trinity College Library and an impressive sight it is. The first photo below shows the high ceiling, packed book stacks and busts of famous philosophers and scientists. This room houses the library’s rare book collection and we passed a nearby room where scholars wearing gloves were examining some of the old books. The 2nd photo shows the high book shelves and one of the many ladders needed by the library staff to retrieve the books. The natural light coming through the window might be seen as a metaphor for the enlightening knowledge contained in the books. The library is one of the UK and Ireland’s legal deposit libraries and thus holds a copy of all books printed in the UK and Ireland. I’m proud to know that the library contains all of my academic books and my recent local history book. Following lunch in the excellent Fallon and Byrne food hall, we headed to see two cathedrals, which we assumed were Catholic (capital C). We then entered a world of semantics. Both cathedrals are Church of Ireland. 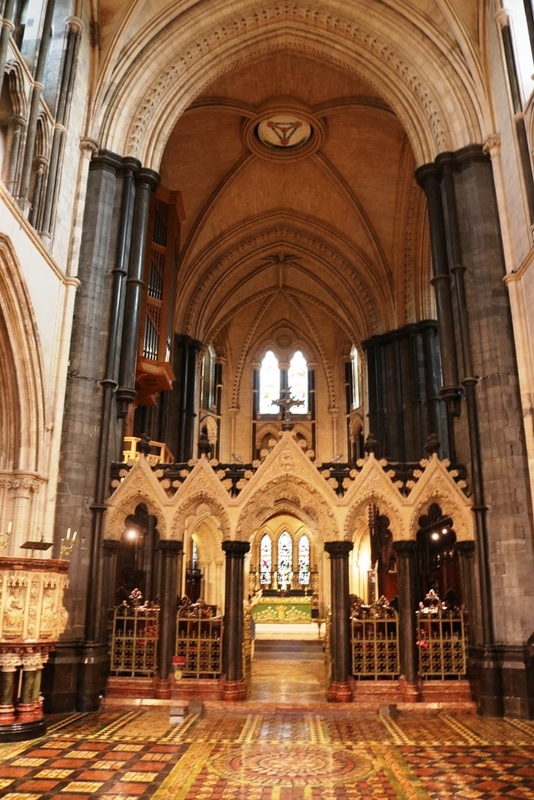 A leaflet in Christ Church cathedral noted that while it was Catholic, it was not Roman Catholic i.e. it did not owe allegiance to the pope. Having established the present day status of both cathedrals – both of which were originally Roman Catholic before the reformation – we could admire the architecture and internal design. 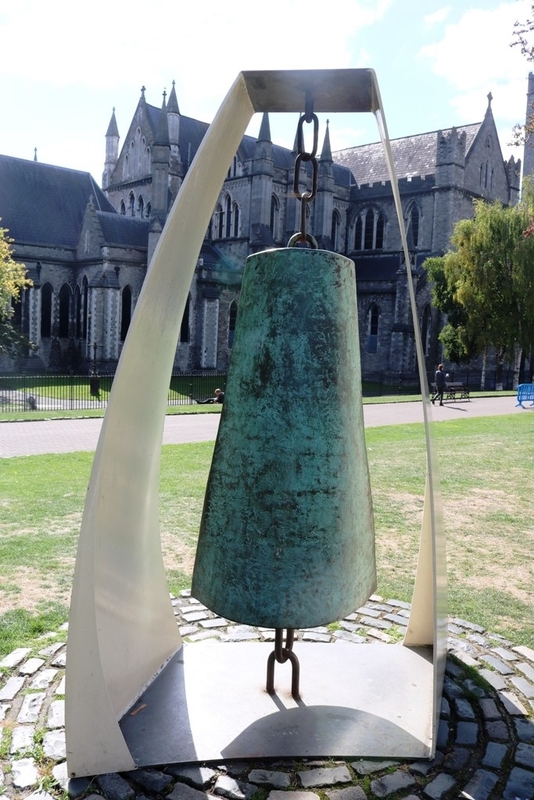 St Patrick’s Cathedral has well-groomed gardens and lawns outside and there is an outstanding sculpture, The Liberty Bell shown below. There were many people enjoying the sunshine in the cathedral grounds on the day we visited. 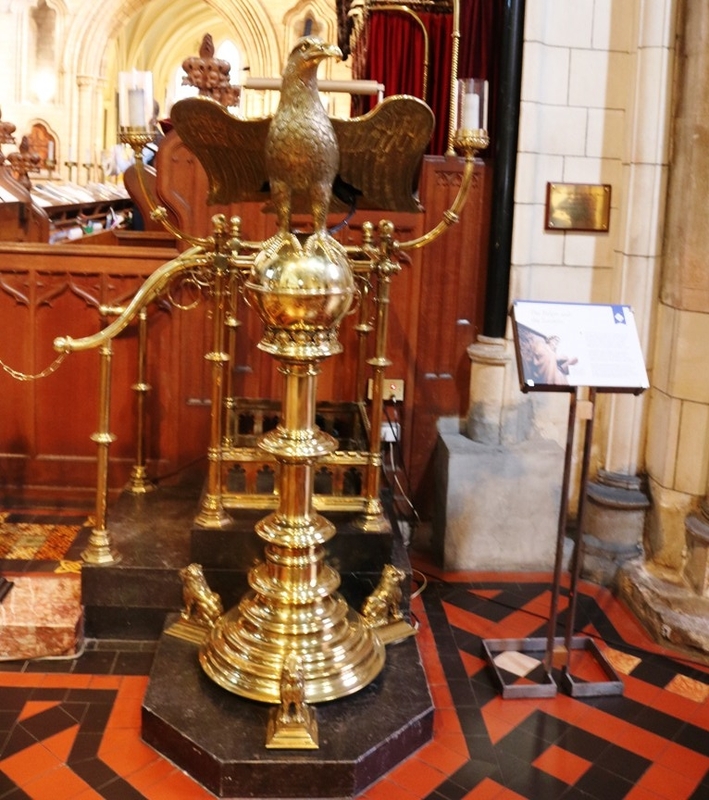 Inside the cathedral, there is a highly ornamental lectern made of brass, with a fierce-looking eagle at the top, seen below. One of the most attractive features of Christ church Cathedral is the floor tiling (scroll down to Medieval Floor Tiles). Some of the tiles are the original medieval ones laid in the 13th century, while most are 16th century reproductions, using the same design. The circular patterns in the wide aisles are most impressive. 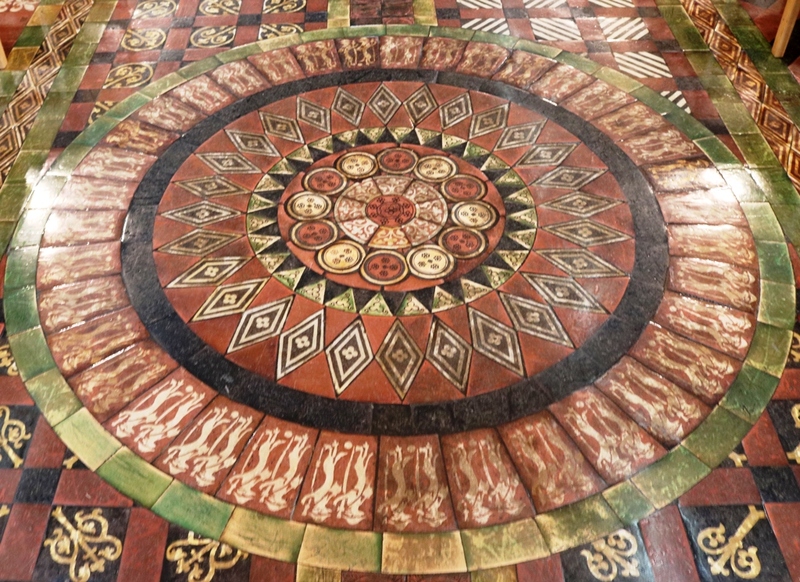 The photos below show the flooring in front of the main altar and a close up view of one of the circular features. The visits to the exhibition and cathedrals were both a learning and an aesthetic experience. If you are in Dublin, go and see them. Firstly, as a follow up to the last post on the T S Eliot Prize readings, you can hear Ian McMillan and the ten poets reading from their work here. While were in the V&A, we visited an exhibition entitled “Into the Woods: Trees in Photography” and it proved to be a fascinating series of photographs. The date range of the pictures on view is quite extensive, with some recent ones, such as Bae Bien-U’s Sonamu (Pine Tree) from 2014 shown below. The information on the photo tells you that “In Korea, the pine tree is an ancient, symbolic subject that was commonly depicted in traditional brush painting”. I thought that there was a calligraphic element to the tree trunks and the trees in the background have a misty, almost surreal quality. It’s a stunning portrayal of an eerie looking forest. Further on the viewer comes toa range of 19th century photographs and the quality of some is amazing – see the website for examples. 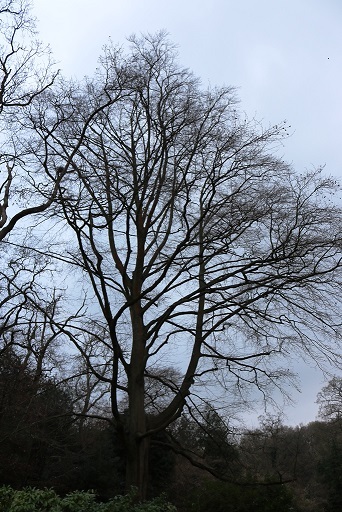 I picked out Edward Fox’s Elm in Winter, shown below. Searching for information on this photographer proved futile, apart from his inclusion in this exhibition. 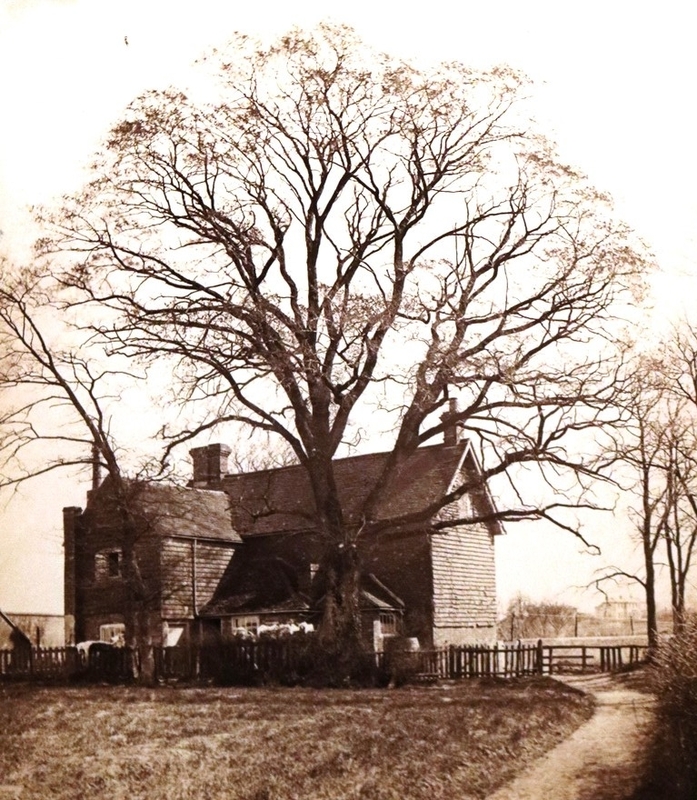 This scene was photographed in 1865 when photography was in its infancy, but Fox has given us a view over which our eye wanders – up the path, up and across the branches of the tree, and over the different parts of the house and garden. Fox captures the magnificence of the tree, which dwarfs the house both in size and in splendour. 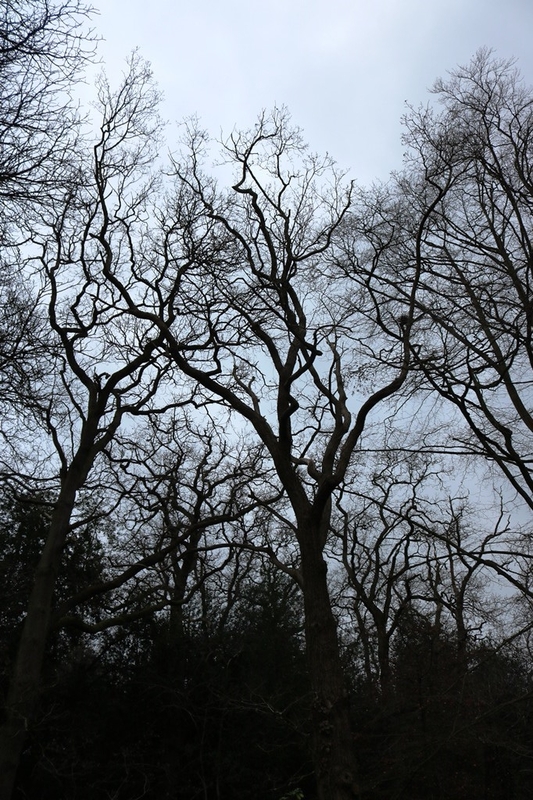 My own photos of bare trees, taken in Compton (see below) are not of the same quality as those above, but I find that the shapes, the outstretched branches and the entanglements are intriguing. We visited the Watts Gallery – Artists’ Village on a rather dull and cold (for the south of England) day. It is situated just outside the attractive village of Compton in Surrey and consists of a range of buildings which house galleries, exhibitions, studios and a chapel. Our first stop was the chapel (good video), designed by Mary Watts and built by her and 74 local villagers, whom she taught in pottery and ceramics classes. The inside of the chapel is round, with religious figures on the walls and a superb Celtic panel which goes around the chapel, part of which is shown below. 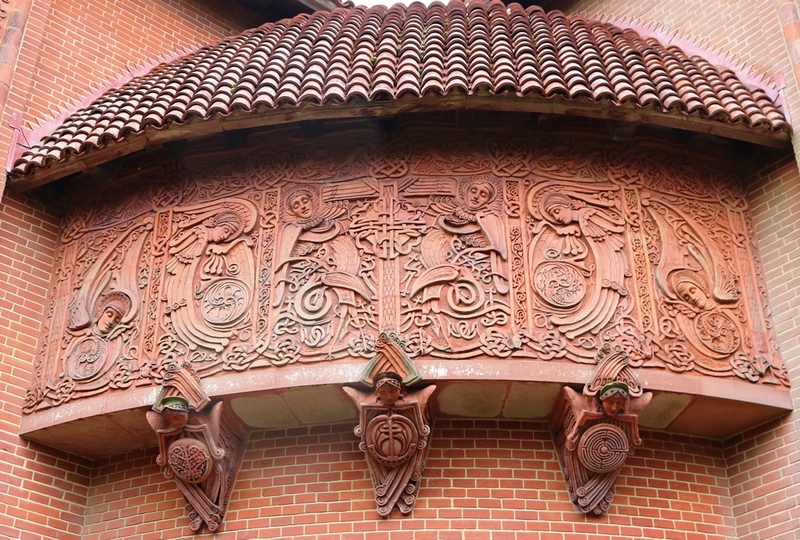 Outside the chapel, there are further intricate designs on the doorway and on the external walls – see below. The Watts Gallery is mainly named after G F Watts, the famous artist and sculptor, whose paintings such as Hope proved inspirational. Watts was also a renowned sculptor and was known as England’s Michelangelo. 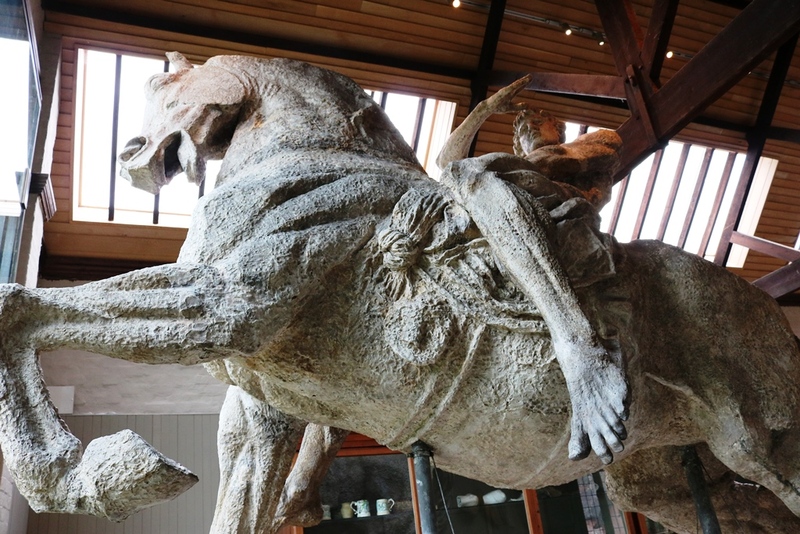 At the gallery, you can see, in one of the studios, Watts’ original plaster cast of Physical Energy (photo below), which was used to make the impressive bronze statue in Kensington Gardens in London. You stare in wonder at this sculpture, which must be 15 feet high at the top, as it is huge and delicate at the same time. There was much more to see on our visits, such as exhibitions by Helen Allingham (good video) and Diana Croft – no room for them here. This was a visit that lasted – with a tasty lunch – for 5 hours and it is superb value. If you are ever in this area, do not miss it. 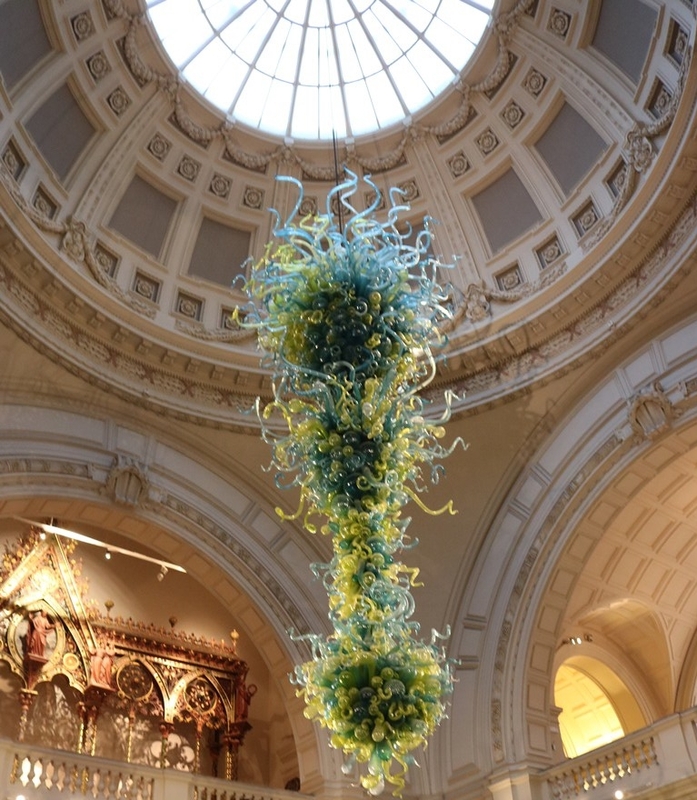 A visit to the Victoria and Albert Museum is always rewarding. In fact, you could spend most of the rest of your life going around the museum and always finding something new. The hanging sculpture at the entrance (below) quickly catches your eye. This radiant splash of colour and anarchic shapes contrasts with the more traditional – yet magnificent – dome above. Sculpture at the entrance to the V&A. Just along from the main desk is the room containing material from the “Medieval and Renaissance [period] 1350-1600”. 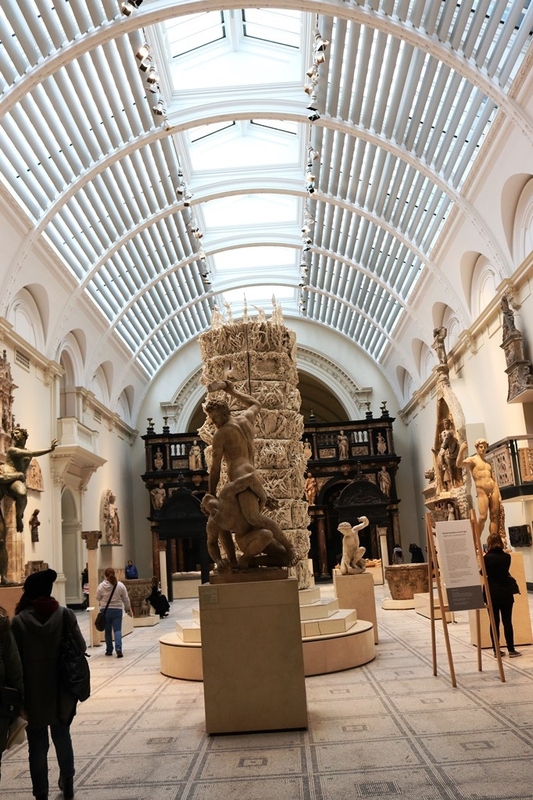 What strikes you first when you enter the room is the vast array of sculptures on show, but then your eye goes upward to the very modern ceiling with its row of tubes and the line of central windows which let the natural light flood the exhibits. I wandered through the Europe 1600 to 1815 galleries, which are one of my favourite places to visit in the V&A, and I came across a new creation – The Globe (check out the video). 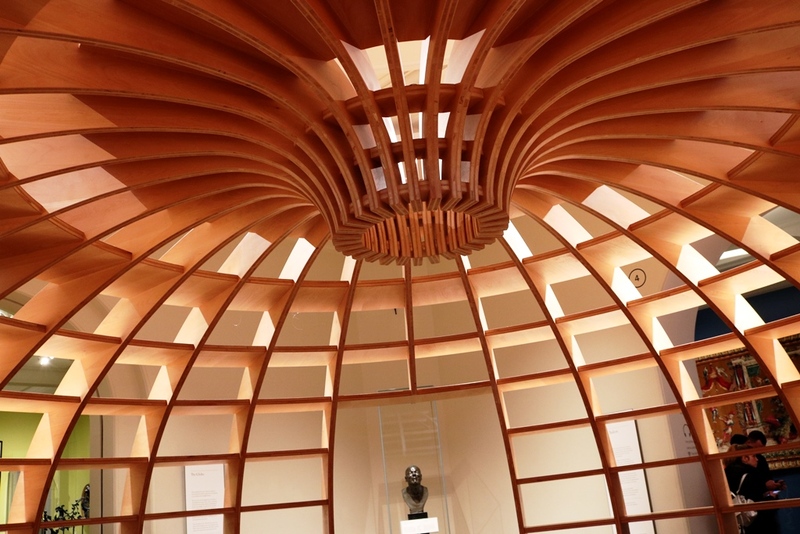 Sitting inside The Globe (photo below) is like being in a wooden igloo, with gaps, and your eye is drawn around the smooth wooden walls and up to the central hole in the “ceiling”. It’s very peaceful to sit and appreciate this beautiful creation. One of the curator’s comments is “The structure refers to several images from the Age of Reason. It can be viewed variously as a hemispherical map of the world, a bookcase, an interior from a great library classifying all human knowledge, a symbol of the universe, or an architectural model”. So, despite this being a 2015 installation, it fits in well with the 1600-1815 objects on display in the various rooms. I thought it was a brilliant idea, creation and space. In most cases, when I buy a book in a bookshop – I try to do this mainly, although I do order online as well – and read the blurb and the recommendations from reviewers, I enjoy the book, and mostly agree with the positive reviews on the cover of the book. 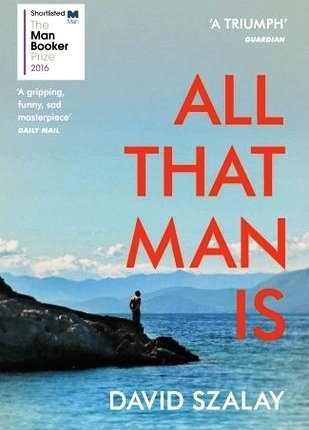 I have just finished David Szalay’s novel All that Man Is but I found myself not agreeing with most of the review quotes. In the book, there are 9 stories of men of different ages and nationalities telling the reader their woes – often related to romance or the lack of it. There are some quite humorous scenes and there is no doubt that Szalay writes very well for the most part. I agree with the Guardian reviewer that 9 stories do not a novel make, despite the fact that there is a common theme of men in some sort of trouble and doing a lot of soul searching. I imagine that many female readers – as well as male readers – might find that some of the men in the stories are pathetic and need a good shake, although some female reviewers praised the novel. There are some very good passages in the stories and in the last one, the man reflects on how, to him, the present often seems to be impossible to define, that indeed impermanence is the only permanent factor in our lives. 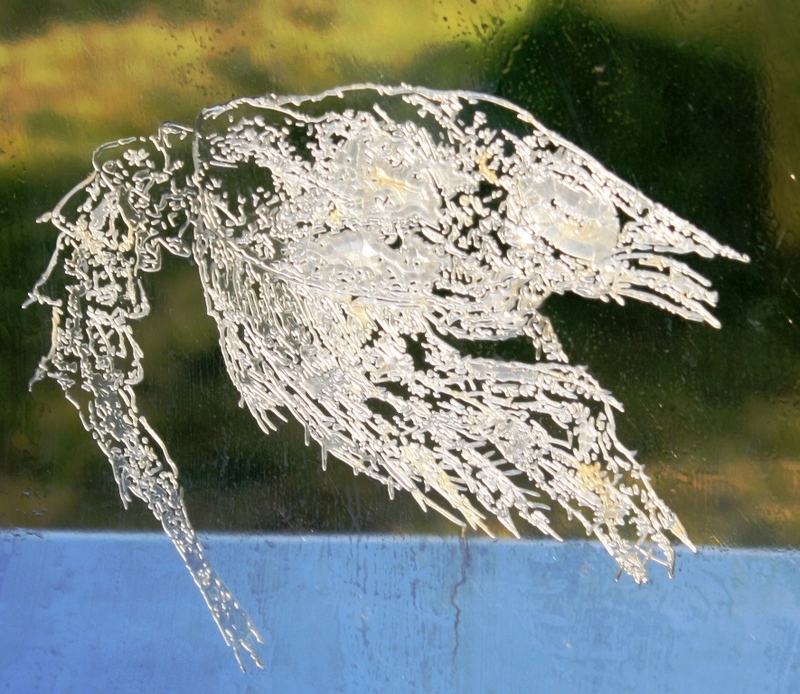 Szalay writes “How little we understand about life as it is actually happening. The moments fly past, like trackside pylons seen from a train window”. On the other hand, this guy thinks he is old and not long for this world as he is 73. My cycling pal John is 74 and he floats up hills on his bike. The book was shortlisted for the Man Booker Prize 2016 and you can read a very positive review of the book here, so don’t let me put you off trying it. If you’ve read it and enjoyed it – post a comment. In mid-October, we went down to by train to Thames Ditton for my sister-in-law Hilary’s significant birthday celebrations. We had a charming walk along the Thames, going through part of the impressive Hampton Court. 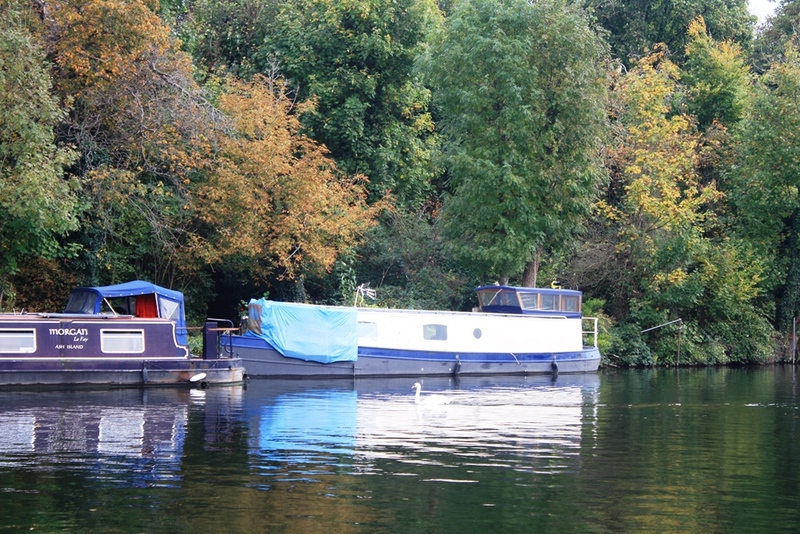 On the Thames, we passed numerous house boats which were reflected in the river, and enhanced by the backdrop of autumnal trees, as shown here. On Hilary’s birthday, we all went to Cliveden House (pronounced Cliv-den) with its magnificent grounds and luxury hotel. The property was built by the famous American millionaire William Waldorf Astor, who passed it on to his son Waldorf. 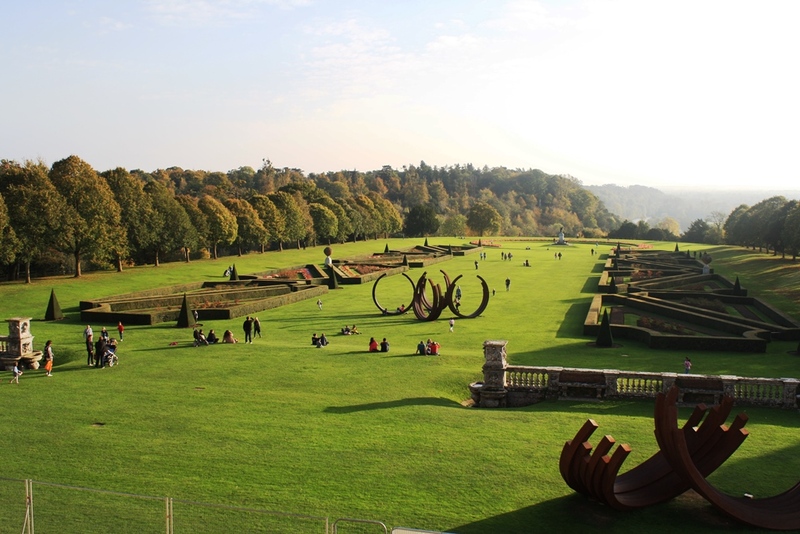 The grounds are extensive and on a sunny day, you can enjoy a peaceful, rural walk past the modern sculptures, seen here in the context of the grounds and then, closer up, looking back to Cliveden House. Cliveden House is historically best known for the infamous Profumo Affair, the repercussions of which brought down the Conservative government in the early 1960s. When you walk down to the river, you pass the cottage where the affair took place. 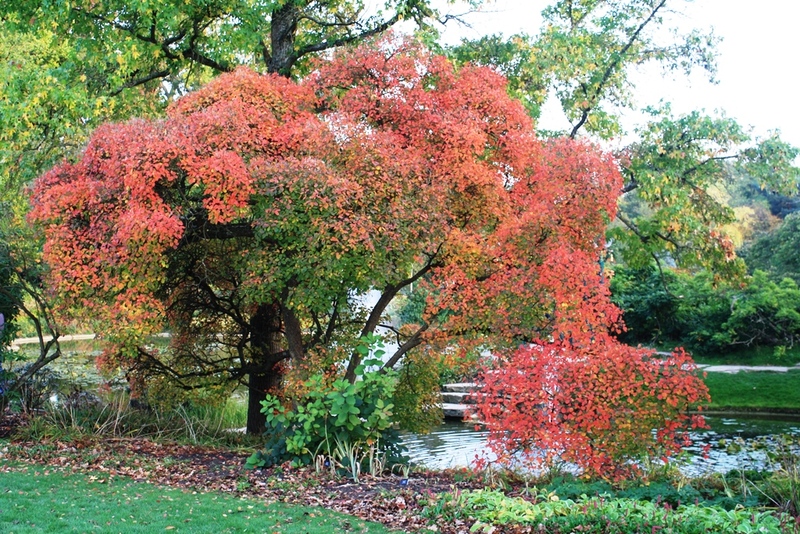 It was a lovely autumn day when we visited and we saw some startlingly beautiful trees by the river, such as the one below. 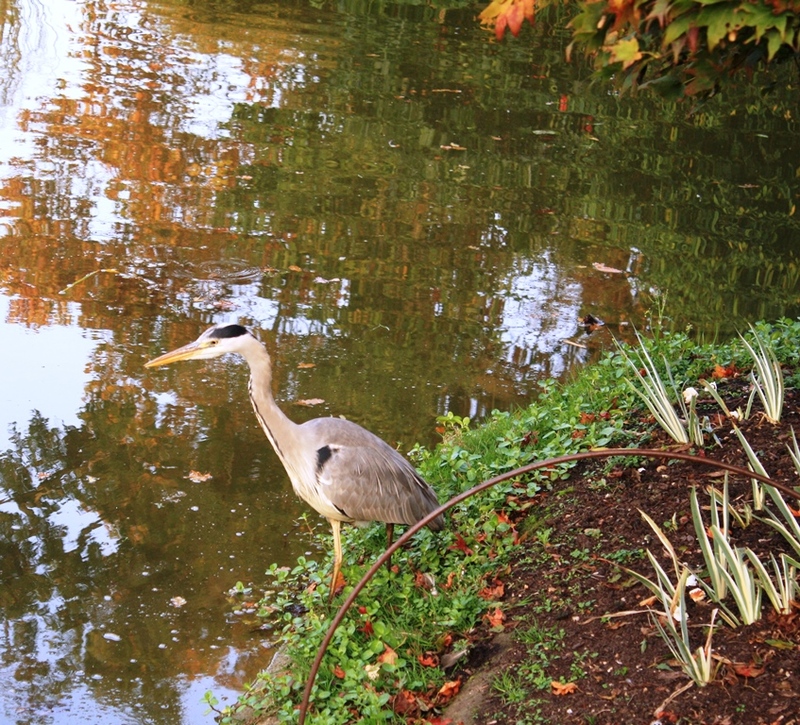 You can also walk by the pond which has a pagoda, a range of trees and on this day, a very calm heron, seen below. Cliveden House and its gardens are well worth a visit if you are in the area. The imagery continues later in the poem “… we are left/ with a row of just-licked-by-a cow-looking boys/ in dressing gowns, Mary in a dress, Immanuel/ in his cradle, low-key and ineffable …”. In Meteor shower, “..and the stars in behind/ shining steady as lighthouses/ and yes, not once but twice/ – there and then there -/ dust on fire at the edge/ of Earth’s flaying atmosphere,/ scoring its signature”. The word “flaying” makes these lines, suggesting chaos. There are a sequence of poems entitled “Whitelessness” which looks at how different scientists might view Greenland. The Geologist finds ” .. the ridges of human teeth:/some early Palaeolithic adolescent caught/ grinning at the moment of death/ in a stone photograph”. The Photographer observes: “The red earth holds up/ a rainbow in its outstretched hands”. As The Geographer studies the earth, “Ridiculously/ overdressed, two musk ox trundle past. / We must sound enormous – / …. but they blank us nevertheless”. These are just a few examples from the book, which rightly won The Forward Prize for Poetry in 2017. It also has a beautiful cover. Get a hold of it if you can, preferably by buying it from the Poetry Book Society. 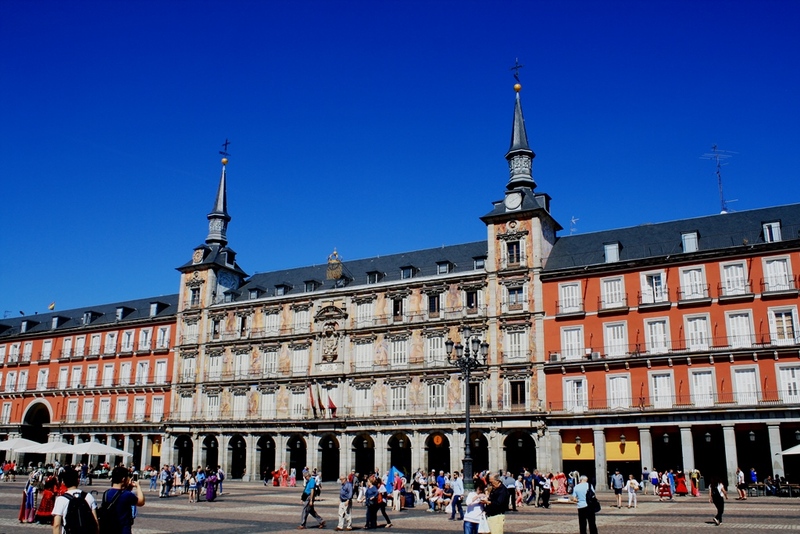 Where to begin with Madrid’s magnificent architecture? I’m concentrating on the older buildings and monuments, but there’s an excellent slide show of modern architecture here (good photos). 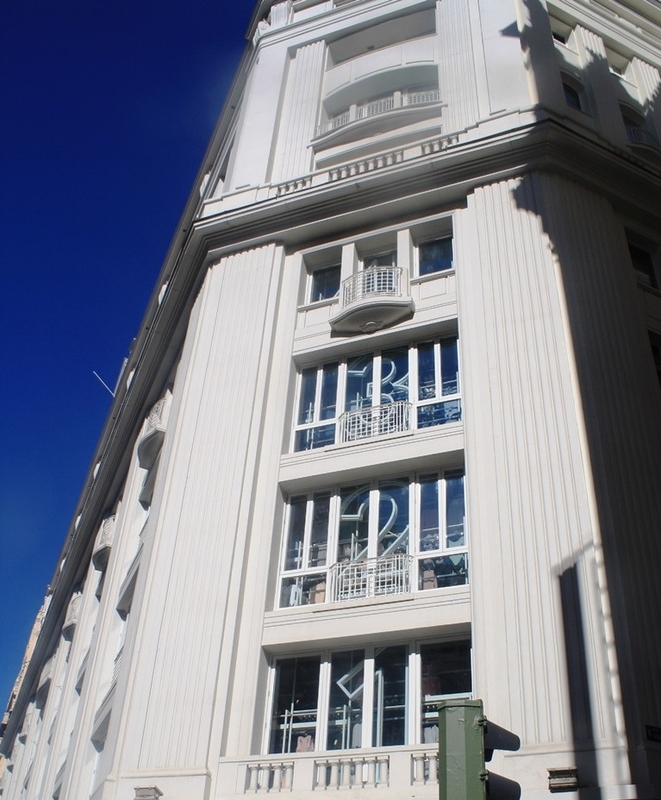 Our apartment, with its high ceilings and cornices, beautiful parquet flooring in different designs, had two large windows, each with a small balcony which looked across the to Palacio Cibeles. You can sit in the outside bar at the top of the building for 4 euro per person and we enjoyed a glass of wine there one evening, as well as the stunning views across the city, in the photos below. The first photo looks down on the Casa America (good photos) and on to one of the modern art deco influenced buildings behind. The 2nd photo looks down on the extensive army headquarters, known as the Buenavista Palace and we were unfortunate to miss the Changing of the Guard (good photos). 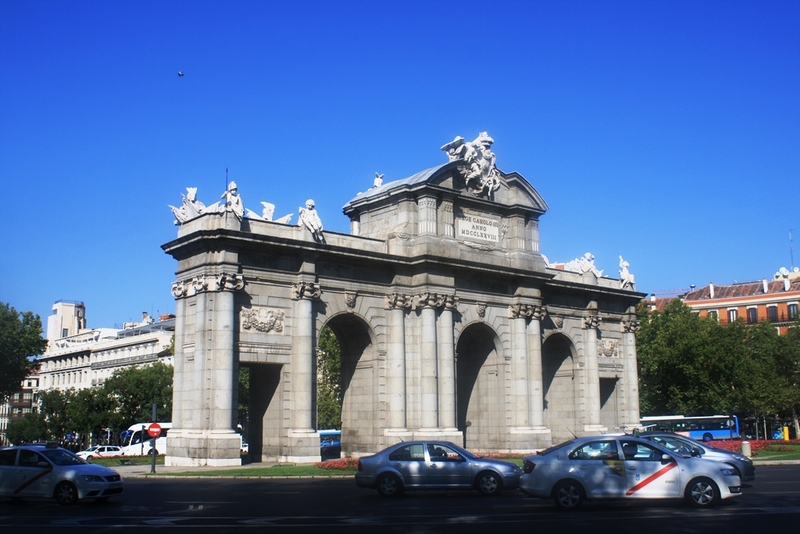 Not far from the Palacio Cibeles, you come across one of the many puerta or gates to the city of Madrid. 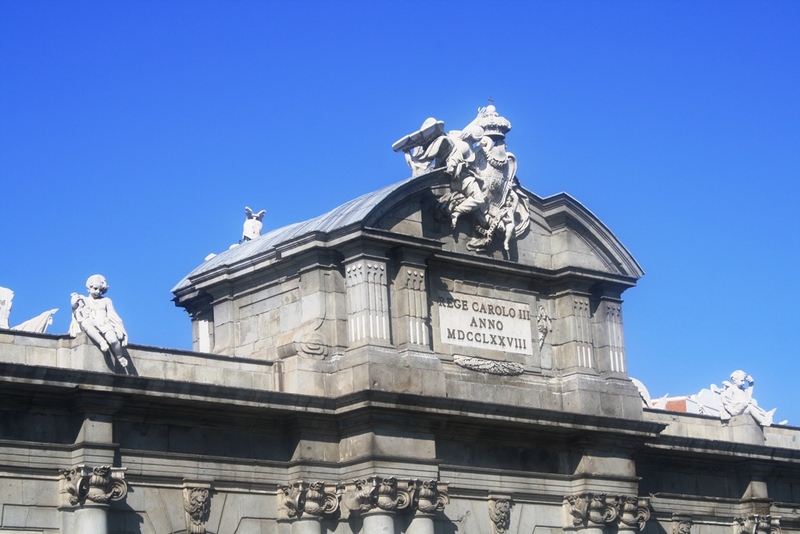 The photos below show the Puerta de Alcala, a magnificent structure ordered to be built by Carlos III, King of Spain in 1778. Carlos was obviously not a man to do things by half and the puerta dominates this part of the city. On the right of the puerta is the Retiro Park, featured here last week. 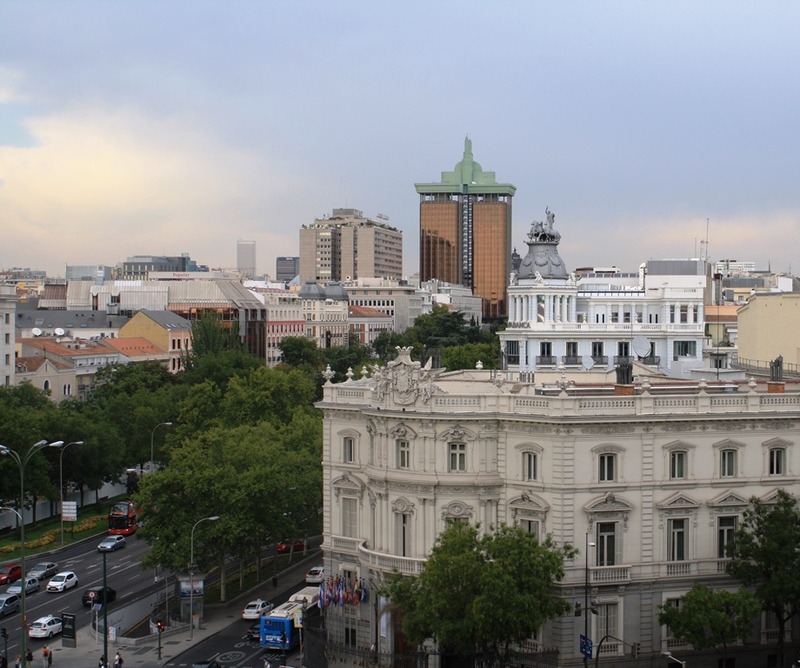 Madrid city centre is teeming with stunning buildings, from the apartments on the Gran Via (good photos) – 2 photos below – to the umpteen churches and palaces – too many to mention here. The Gran Via is Madrid’s busiest street, best avoided at weekends. 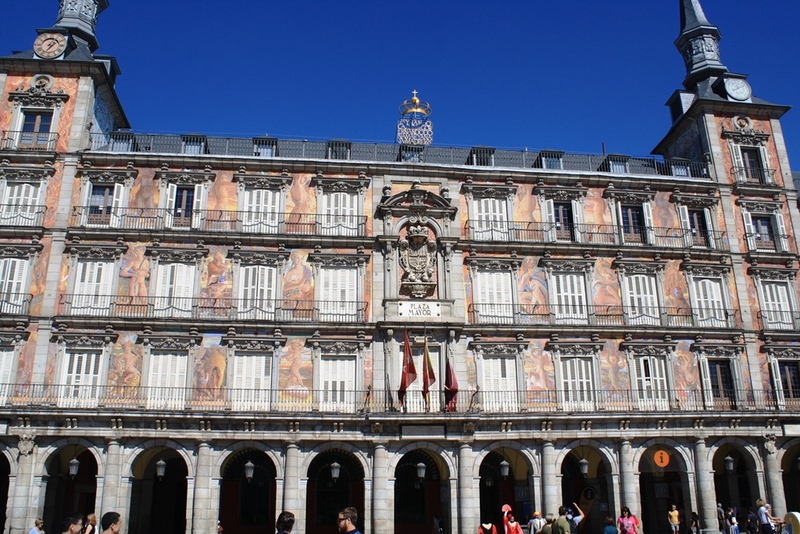 The Plaza Major is often described as being at the heart of Madrid and it certainly is beautiful square, comparable in terms of the buildings/apartments, to St Mark’s Square in Venice. Again, if you go at weekends, you might never see the square properly, as there are so many tourists, but go midweek and you’ll be able to appreciate its grandeur to the full. We went to Aberdeen recently to see our nephew before his graduation from Aberdeen University. We stayed at the excellent Chesters Hotel where we had a superb (but pricey) meal in the evening at their 1X restaurant. My starter was ravioli of crab and scallop, with celeriac puree, shellfish bisque and langoustine beignet. It was the beignet that I didn’t know about but it turned out to be a small prawn done in a very light batter. It was very well presented – alas no photo – with both the ravioli and the bisque being light and tasty. It looked like the one pictured here. 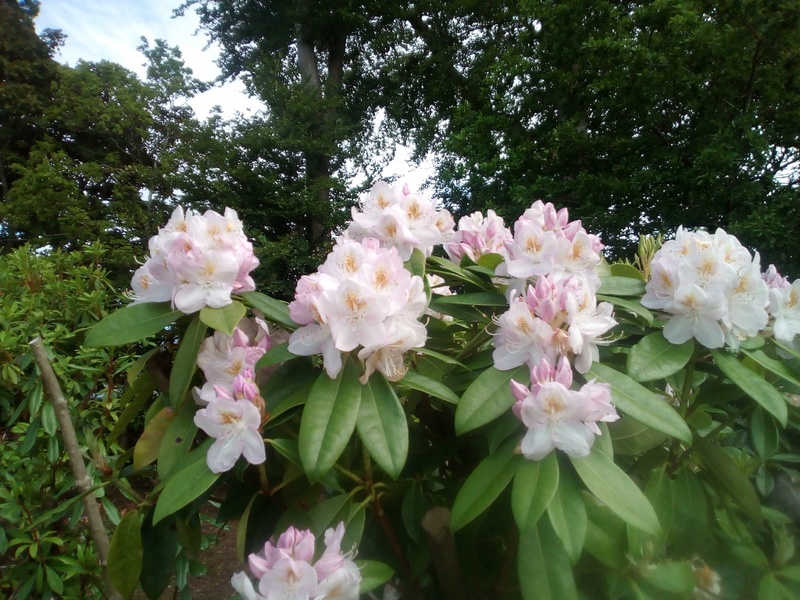 Earlier in the day, we went to the extensive Hazlehead Park and were particularly impressed firstly with the range of rhododendrons on show. There were several different colours with a pink one shown below. My new mobile phone has a better camera than my last one, which came to a watery end when I was out cycling and got soaked. The phone was uncovered and basically drowned. The man at the phone repair shop took one look at it and told me to buy a new one. Although the camera is better, it is not good at close-up shots but not bad from a short distance as the photos below will show. As you guessed, it’s not an expensive phone. 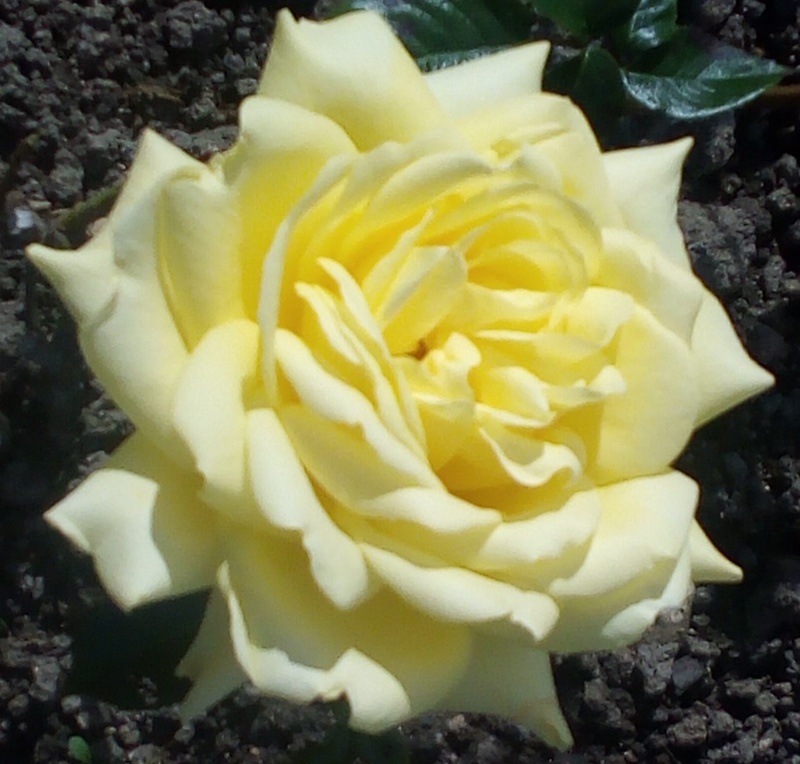 We then went into the huge rose garden and although not many of the roses were in bloom, there were some stunning examples, such as these shown below. 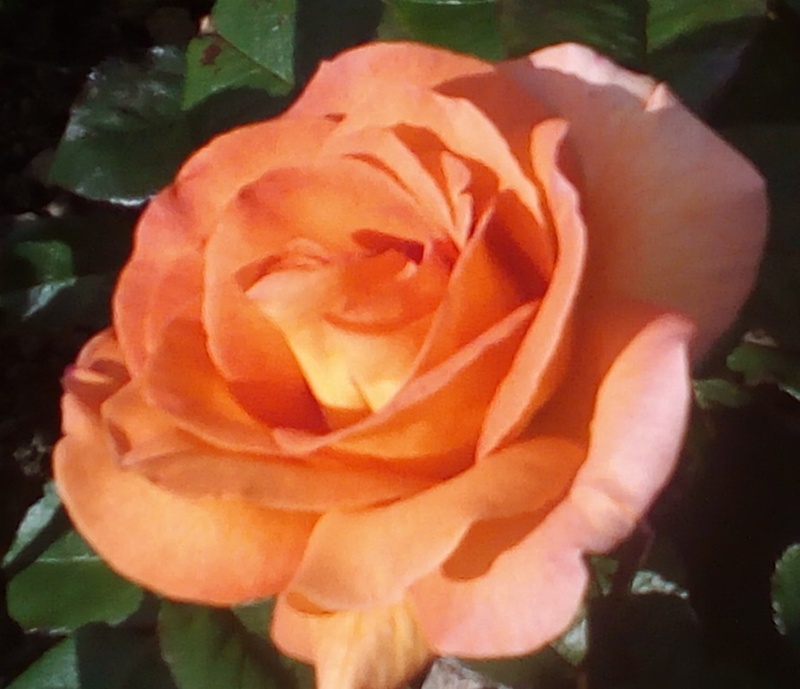 There is a lack of clarity here (mobile phone) but the colours and the delicate folds of the rose are remarkable. 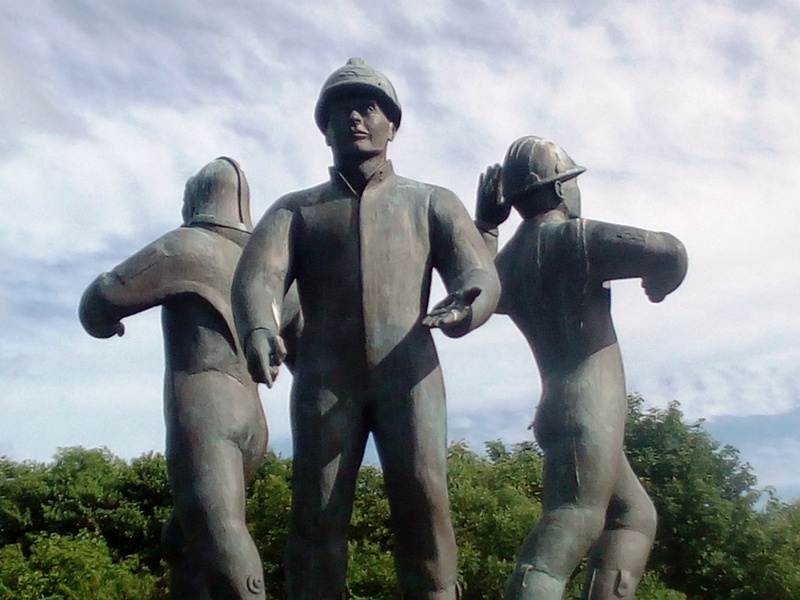 In the first section of the rose garden, there is a large memorial to those who lost their lives in the Piper Alpha Disaster in the North Sea in 1988. The memorial lists those who died and the sculpture shows three oil rig workers. The figures look as if they may be calling for help and many visitors may recall the horror of the photos of the oil rig on fire. The contrast with the beauty and calm of the rose garden and the disaster is poignant. James Sheard’s collection The Abandoned Settlements is a Poetry Book Society Choice and therefore highly rated. I thought that the early poems, which harked back to different places and different people were very well constructed and poignant. The title poem ends “For love exists, and then is ruined, and then persists” and this turns out to be the theme of the book, a series of reflections and memories of love and lovers, of beginnings and endings. I enjoyed November which begins “Let me tell you how, in this long dark/ I list the ways in which the leaf of you/ furled and unfurled around me”. 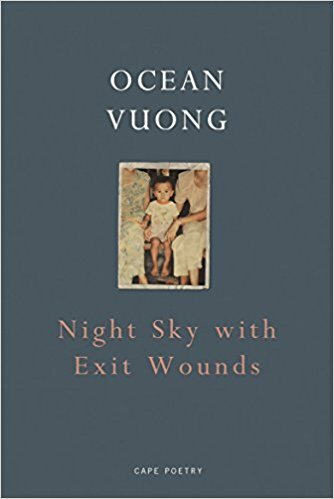 However, as the book progressed, I as the reader could only take so many doleful reflections on love gone bad, no matter how elegant the poems were and how well constructed they were. Others obviously disagree and he has been widely praised. One poem that I did connect with and which was to me the most lyrical poem in the book is entitled Blackthorn: “For two weeks I drove/ through tunnels/ of March blackthorn/ … and liquid growing white/ then full then falling/ in the wind rising/ each overnight and becoming bridal/ blizzarding across/ the quiet early morning/ whipped up by my wheels …”. 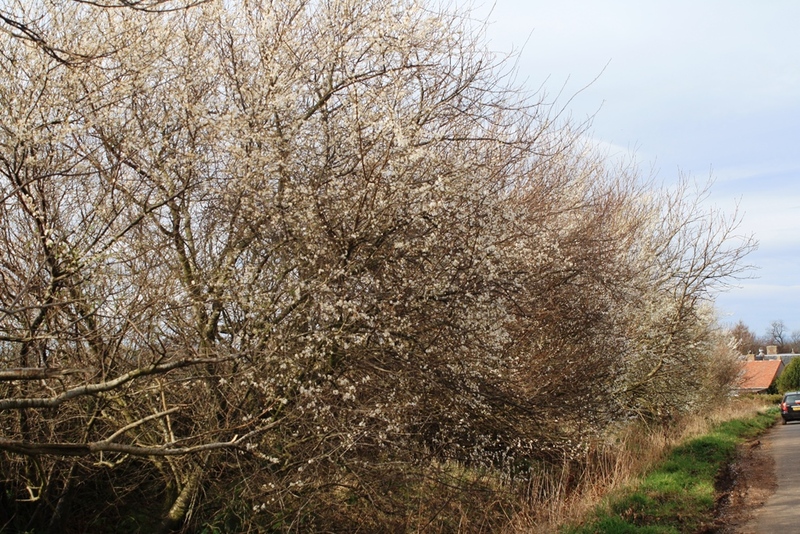 Last year in this blog, I mistakenly identified blackthorn as hawthorn, with these photos below. You can see the link with “becoming bridal”. Following the award of a grant of £700,000, Dunbar Harbour Trust has been instrumental in transforming part of the harbour site. The Battery has a long history, being built in 1781 as a fort to defend the existing Cromwell Harbour from attack by American privateers and also from a possible French invasion. In the 1870s, the Battery became an isolation hospital and at the start of the First World War, the hospital was taken over by the Red Cross and revamped. In the 1930s, it was the site of housing for a time but this was abandoned when the roof blew off. Until this year, the Battery has been an open space for visitors to look out from its walls out to sea or back to the south and the Lammermuir Hills. The Battery (good photos) has now been transformed into an amphitheatre and coastal garden, with areas for public art. I took my trusty camera along to take a personal look. When you go through the stone arch, what first catches your eye is the wooden seating which is part of the new amphitheatre. On closer inspection, you see that on the lovely wooden steps, there are the names from the Shipping Forecast which can be heard on Radio 4. There’s an excellent video available on why people love the Shipping Forecast. The forecast has a lyrical quality to it, as many of the names could be from a poem – North Utsire, (pr Ootseeri) South Utsire, Cromarty, Forth, Tyne, Dogger. As the Battery is next to the sea, this was an inspiring idea. The Shipping Forecast is also a poem by Seamus Heaney from his Glanmore Sonnets and you can hear Heaney reading the poem here – a wonderful experience. The public art on display at the moment is The Sea Cubes by Scottish artist Donald Urquhart. In the photos below, you can see the steel cubes on display and a close up of one of the fossils engraved into the cubes. The cubes are attractive to look at and people of all ages can use their imagination to decide what they look like – ice cubes which have floated down from the North Pole or steel mirrors which have landed from space? They are a very peaceful sight. When you look closely at the intricate nature of the engraved fossils, you can see the complex structure of these fairly basic creatures. This one also reminded me of a map of an archipelago, with a thousand islands. The Coastal Garden section is also very interesting and pleasant on the eye. 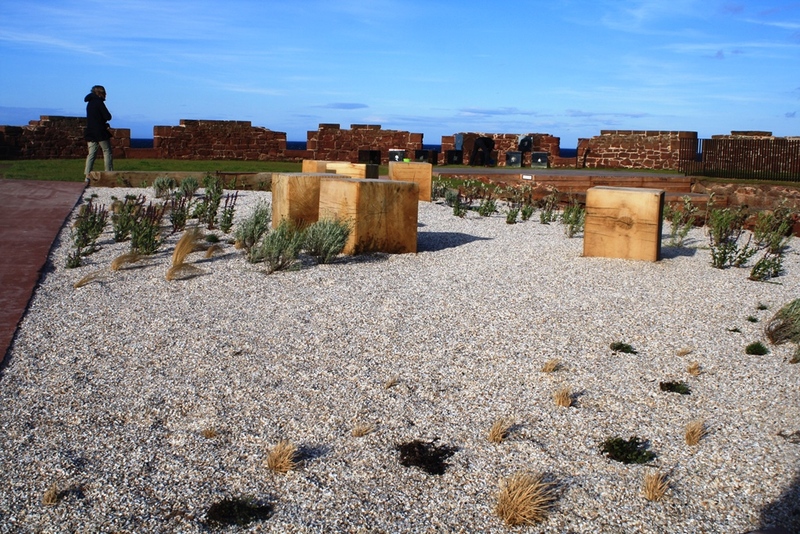 The photo below shows the pebbles, the wooden blocks and the range of plants which can survive in the harsh seaside conditions. The plants include sea pinks (aka thrift), red valerian and Caradonna Meadow Sage. It will be interesting to see the plants develop and spread and bring more colour to the site in the future. 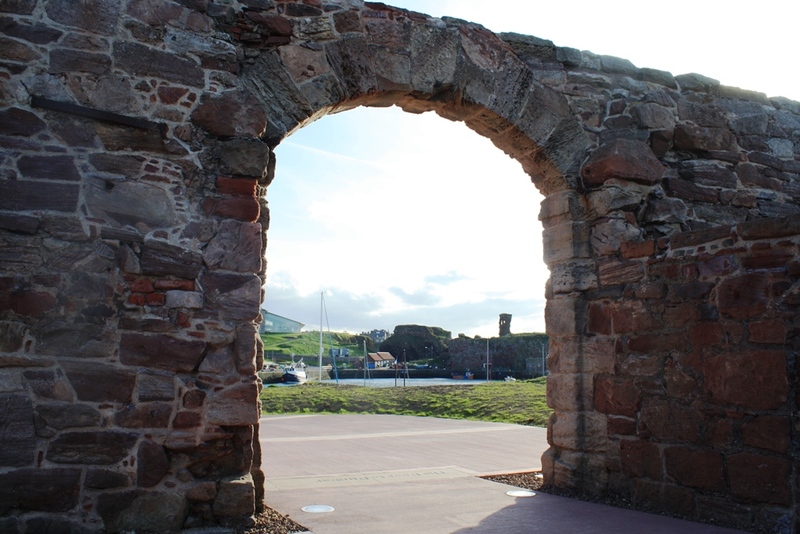 As you leave the Battery, you see Dunbar Harbour and Dunbar Castle through the archway as in the photo below. 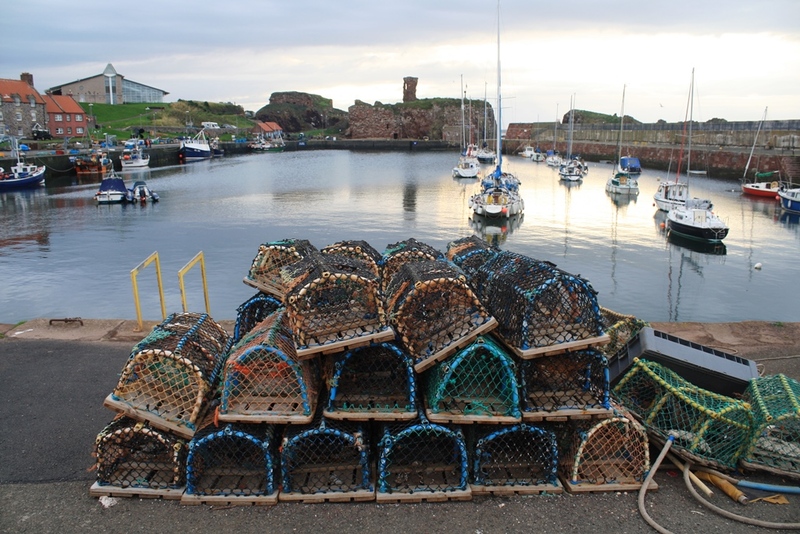 I’ve featured Dunbar Harbour on this blog a few times and it is an ever-changing view, as the light differs or there are different boats in the harbour. The 1st photo shows the magnificent stone wall and arch which gives solidity to the entrance and frames the harbour very well. After you walk down the slope from the battery, you are on the harbour quayside and you are looking across the harbour to the castle, as in the 2nd photo below. This is the view on a calm summer evening at the harbour. In October, the small yachts are taken out for the winter as the winter tides turn the harbour into a turbulent rush of water. Dunbar Harbour and Dunbar Castle from the Battery.